They look like big cuddly dogs with thick white, gray or brown fur, but wolves are not like the pups in our backyards, my guide, Mary Ann Murphy told me as toured Wolf Haven International near Olympia, Washington last week. As she filled my head with wolf facts, she called me back every time I took a step toward the chain link fences where the wolves live in pairs. 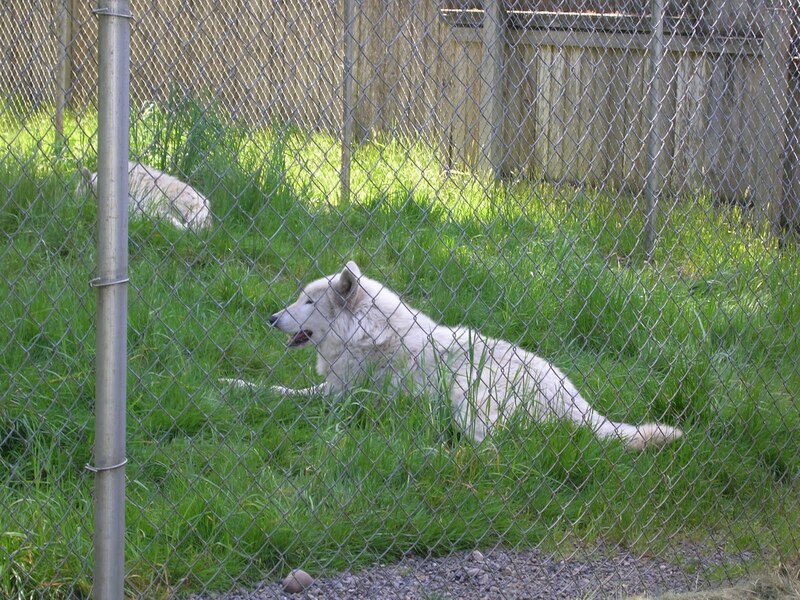 Remembering how the Arctic wolves in the White Wolf Sanctuary in Tidewater, OR, charged the fence when I raised my camera, I obeyed. It was one of the first warm days of the year, and most of the wolves napped in their enclosures. They look docile, and wolves are beautiful animals, but they make lousy pets, Mary Ann said. They cannot be house-trained, they tend to vie for power, they like to hunt, and they bite with 1500 pounds of pressure, twice that of the average dog. Most wolves taken in as pets are euthanized before their third birthday, she said. Many of the 50 wolves at Wolf Haven are being prepared for release into the wild and are not on the tour. But that still leaves plenty of wolves to see. We saw many gray wolves, which are not necessarily gray. The largest, male grays like Jakey in the photo, range from 80 to 110 pounds. The females weigh 60 to 80 pounds. All of the wolves have longer front legs, wider feet, and narrower chests than their dog counterparts to help them run through snow. We paused in our walk along the graveled path as the wolves began to howl. First one began, then another. Soon they were all howling. Wolves howl to locate each other, to mourn, to ward off predators, and to vocalize their social ranking. As I doggedly headed toward the nearest enclosure to get a picture of a howling wolf, Mary Ann called me back. Must stay on the tour, she said. Grumble, but it’s stressful for the wolves to have people coming through every hour. Wolf Haven, spread across 80 acres among forests and farmland, opened in 1982. In addition to paid staff, volunteers lead tours and help with summer howl-ins and campouts, photography tours and educational seminars. Beyond a large picnic area near the entrance lies a wolf cemetery, where rock-covered graves mark the final resting places of wolf residents who have died. Wolves only live five to eight years in the wild, but they can live 14 to 15 years in captivity. They mate for life and grieve just as humans do when their partners die. As I paused to take pictures, I could feel the spirits of those wolves howling softly around me. I went to Washington to do an article on the Monarch Sculpture Park (very cool. See http://www.monarchartcenter.org). Everywhere I went, people asked if I had been to Wolf Haven yet. It wasn’t on the itinerary, but since it was on the road between Monarch and the motel, I figured why not. I’m glad I didn’t miss it. Wolf Haven International is located at 3111 Offut LakeRoad in Tenino, Washington. Admission is $9 for adults, $7 for kids age 3-12, and $8 for seniors. The sanctuary is closed to the public on Tuesdays and during the month of February. For more information, call (360) 264-4695 or visit the web site at http://www.wolfhaven.org. The noise you hear in the background on the website is howling wolves. The site offers a five-minute virtual tour, information about wolves and the history of Wolf Haven, and ways to contribute. There’s also a fabulous page with pictures and songs of area birds. Thanks for sharing this, will be sure to visit some day. Next Next post: Help, It’s Not Raining!